Located at the heart of the hotel, close to all facilities including the mini-club, the Family Duplexes offer the perfect holiday accommodation for a family of five. Sleek lines, together with a mix of light wood furniture, soft colours and local arts and crafts create a welcoming atmosphere. For the privacy of parents and children alike, a staircase leads to a mezzanine especially designed for the kids to use as their own den. 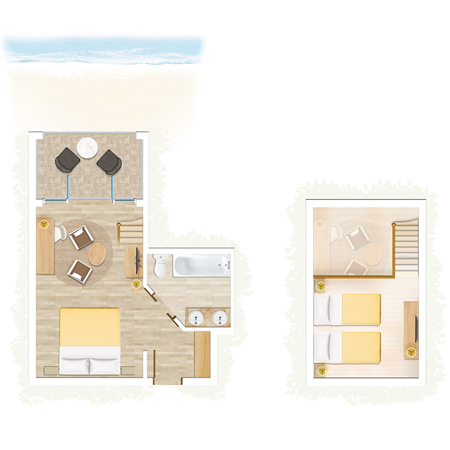 The indoor living area and terrace or balcony provide plenty of space for families to enjoy quality time together. Parents will have the choice between two different holiday atmospheres when deciding on a Family Duplex. Some open onto the tropical gardens and others are only a few steps away from the beach.